Is your tire flat or damaged? 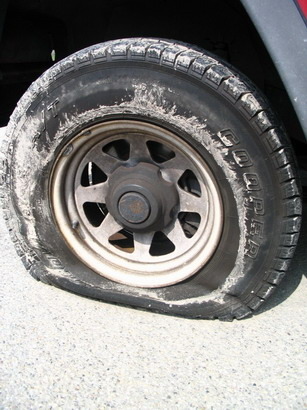 If one of your car's tires goes flat, stop driving on it as soon as you can and do not attempt to repair it yourself. Replace it with a spare and come into Ian's Tires and Auto Repair right away. Our Santa Barbara tire repair professionals will first conduct a thorough internal inspection to determine if your tire can be fixed, and then we'll do the necessary work or get you a new tire. Because punctures can vary in location, diameter and impact, some damage may not be repairable. For example, a nail or screw in the tread can usually be safely repaired, while holes in the sidewall or larger than 1/4" may result in secondary damage that is beyond repair. All parts of a tire are designed to function as a single unit, and if a puncture cannot be filled and sealed properly, the tire will no longer be safe. Repairs must be made from the inside of the tire after it is removed from the wheel rim by specially trained tire repair experts like ours. Even if your tires are not flat, their performance and safety can become compromised by impacts (such as with curbs), cracks, air loss and other problems. Be sure to have the condition of your tires inspected by Ian's tire repair pros on a regular basis.